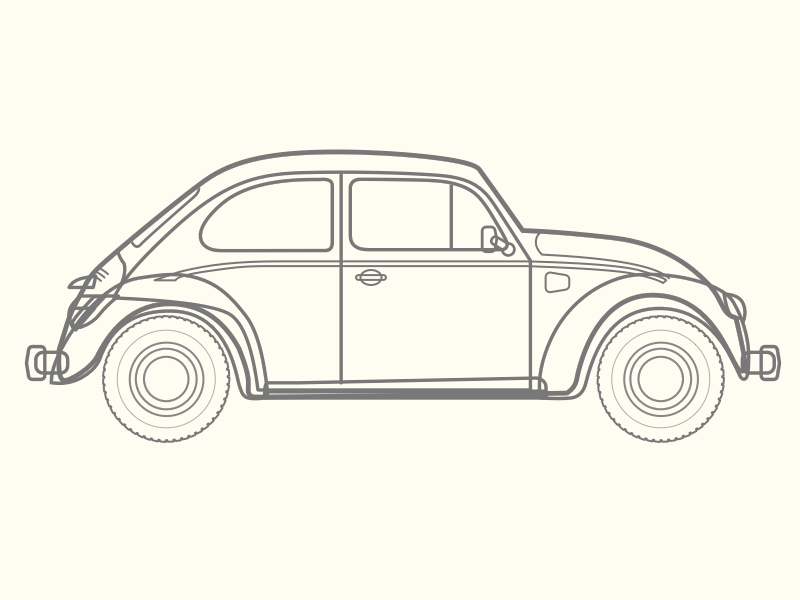 Volkswagen’s Beetle aka Volkswagen Type 1 is a classic in car history. It dates back all the way to the 1930's in Germany. This car was built for the people and it's amazing how its gone through many design changes, but managed to stay true to its roots. Much of the appeal comes from its distinctive shape and overall size. I’ve always admired German design, for their simplicity and form. With the successful "Think Small" advertising campaign in the 1950’s, The Beetle penetrated the U.S. market. Keeping in mind that this was post WW2 and buying a German car was probably a bitter thought at the time. And yet they somehow executed. What was the marketing secret? Being bold and honest. Truth sells. Enough history, let's move onto the good stuff! With the goal of leveling up my illustration skills, I decided to start simple. All of these images were drawn in Sketch. This was my first attempt at drawing over a car. Reference photo, a last edition VW Beetle. The last 300 produced. What do you all think? Lines vs no lines?